Now I know that rockets are big, but until you stand underneath one, you can never really imagine just how big they really are. There was a huge amount of wondering “Are they really THAT large?” going on today. We started the day very, very early as we were being picked up by our taxi at 7.15am, to take us to our meeting point “The Big Orange”. And yes it was a big orange, or half of it, otherwise it would be rolling all over the place. It was a shop that only sold citrus fruit. I wondered if I should go in and ask if they had any apples. Anyway, our coach finally arrived and picked a little group of us up, then went onto several more pick up points. The coach was full, and then we had an hours drive to The Kennedy Space Centre. 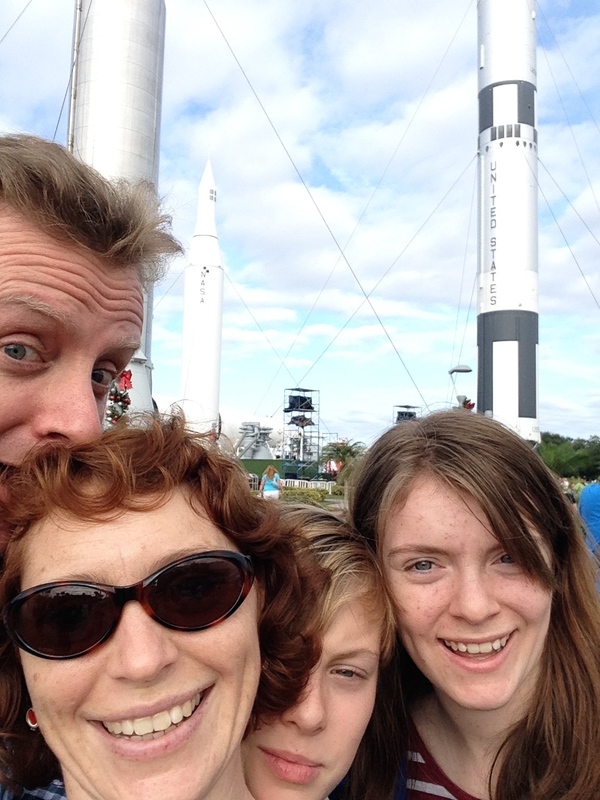 When we arrived we took a quick family selfie before we went into meet an actual real life astronaut Sam Gemar. After his little talk, which was very interesting, (but I was secretly hoping for Buzz Lightyear to come out), we then went wandering round Kennedy on our own. We had to be back on the coach at 5pm, so we had plenty of time. We got to see the Atlantis Shuttle, which was amazing, and again HUGE!! There is was suspended from the ceiling in all it’s glory. It was so big that trying to get a photo of the whole thing was rather tricky. All I can say is thank goodness for the “Pano” setting on my phone. The kids got to have a go at sitting in a replica cockpit, and climbing through some tunnels. I tried it to but wished I had knee pads on as the plastic tubing was rather hard on the old knees. I can do it to. Maybe with a few more grunts and groans than the kids. We also saw the Saturn V rocket, which they had separated into pieces so you could see all the wiring between each stage, which was superb. It was hanging in a massive hanger, which had to be very, very long. They also had all the flags from each mission hanging up. They’re all different, but make sure you know your roman numerals, otherwise you won’t know which missions they came from. We then took a bus out to the launching site. This was a very iconic place. Even seeing the backs of the seating stands is something to behold. 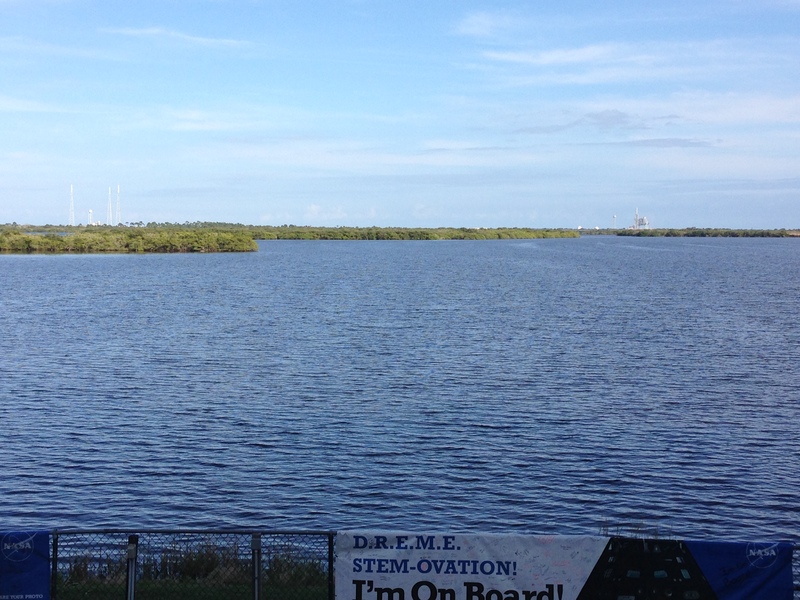 You can sit in them, and 3-4 miles away are the launch pads. You can just imagine what the atmosphere would be like when a rocket takes off. Look carefully. One launch pad is on the left, and one is on the right. George was told that there were between 5,000 to 6,000 alligators on the waters around Florida, and he was determined to see one. He spent ages walking up and down the fencing looking in the water, until finally he came running over to us shouting “I’ve found one! !” We all rushed over, expecting it to have either gone, or being very small, and it was neither. In fact it was about 5 foot long!! He was very proud and took the picture of the holiday with our camera. 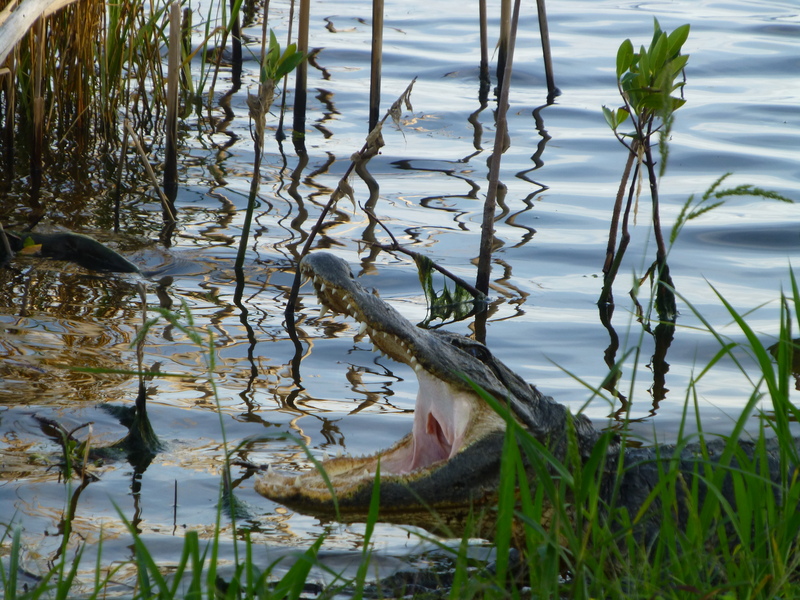 An alligator in all it’s glory. We saw so many different rockets, all to scale, so massive and huge. The lovely simple memorial of those astronauts who died during space missions. This was beautifully done, so simple and elegant. 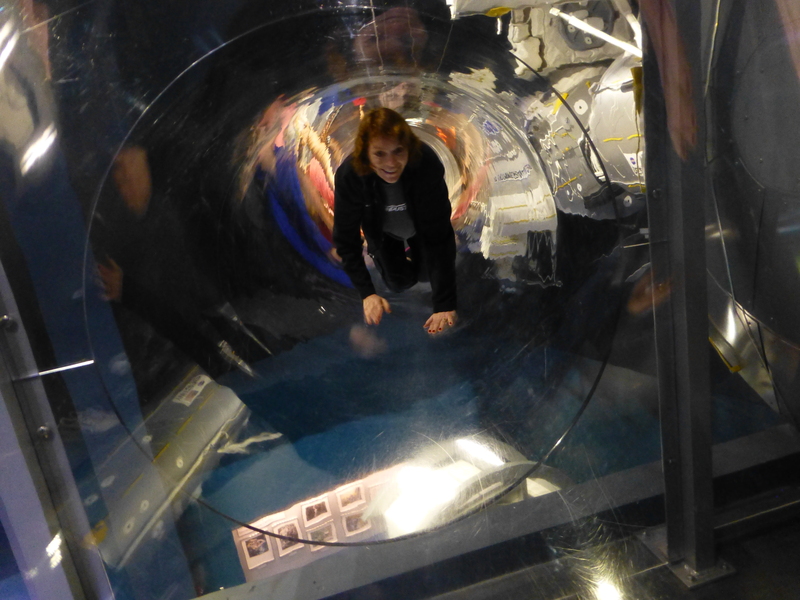 And if you were brave enough you can go in the Shuttle Launch Experience. If you’re not brave enough, then you can just watch. I was very apprehensive about this, but did pluck up enough courage to do it. Although I was slightly regretting this during the experience. But there was a timer on the wall, and I could watch the count down which helped me immensely. The ride lasts for 4 minutes, but seems much longer. You’re strapped in (which is never a good sign), and then tipped back so you’re lying on your back with your legs up. You then shake violently for several seconds, and then you blast off into space. The noise is phenomenal, and apparently like a real launch. After a couple more minutes of violent shaking the engines finally stop and you then very slowly tip forward. They open up the ceiling and you can see moving stars. Then slowly you tip back to normal, and that’s it!! I was told that is was like a rough plane decent, but I would question that. I’ve descended during a storm, and that was much calmer. Still I did it, but it was not in my comfort zone. 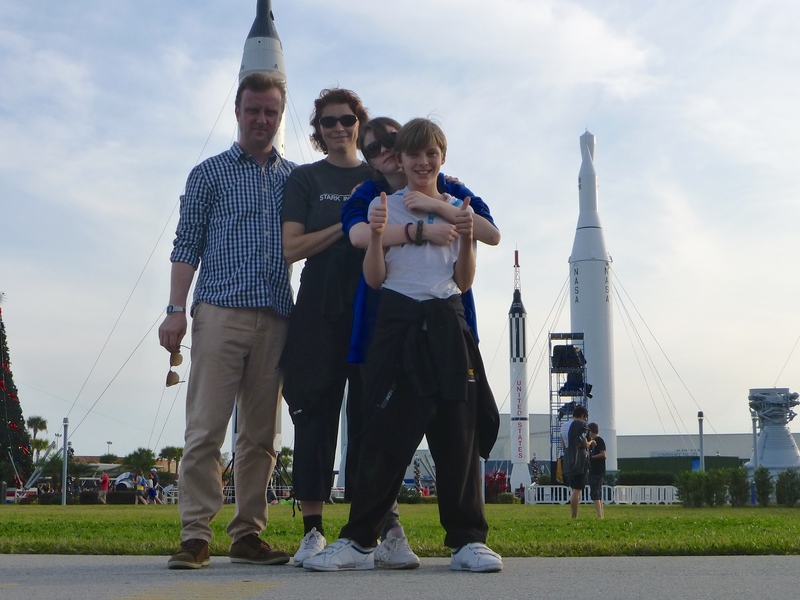 Just before the end of the day we managed to squeeze in another family photo, this time with as many rockets behind us as we could. I’m not sure why Mark suddenly decided to grow a rocket out of his head, but hey ho. Sometimes pictures just turn out this way. This entry was posted in Uncategorized and tagged alligators, Atlantis Shuttle, Buzz Lightyear, claire's allotment, Kennedy Space Centre, Orlando, Sam Gemar, Saturn V, Shuttle Launch Experience, The Big Orange. Bookmark the permalink. and that what is may be a again. The USA is amazing. Everything is so big!! Big servings, big buildings, big queues, big rockets, big roads, I could go on, but I won’t.